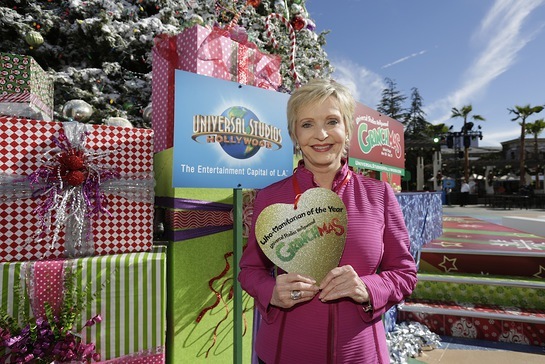 Universal Studios Hollywood celebrated the start of the “Grinchmas” holiday “who-bilation” by honoring veteran stage and screen actor, Florence Henderson with the “Who-Manitarian of the Year” Award in support of her charitable work for the City of Hope research and treatment hospital. The Grinch and his faithful dog Max bestowed the honor in front of an energetic audience from L.A. Family Housing, a non-profit group dedicated to assisting residents transition out of homelessness and poverty through supportive services and a beneficiary organization of Universal Studios Hollywood’s Discover a Star Foundation. “Grinchmas” begins Thanksgiving Day, November 28, 2013 and continues on weekends through December 15, then daily from December 20 through December 31. “Grinchmas” is included in the price of theme park admission. Henderson, best known as matriarch “Carol Brady” from the television classic, “The Brady Bunch,” is a long-time supporter and advocate for City of Hope, a recognized world leader in compassionate patient care, innovative medical science and groundbreaking research. This year, the Universal Plaza, an elaborate grand piazza at the heart of the theme park, will serve as the new venue for the towering “Grinchmas” tree – a whimsical centerpiece twisting and spiraling 60 feet above visitors below. It will provide the ideal location for warm, holiday memory-making while the Grinch and his adorable dog Max entertain guests nearby with fun-filled photo opportunities. Aboard the world-famous behind-the-scenes Studio Tour, fans of the blockbuster film, "Dr. Seuss’ “How the Grinch Stole Christmas,” will have the chance to enjoy a close-up view of the original Who-ville film sets with a one-of-a-kind performance by a Who’s Who of Who-ville re-enacting memorable scenes and songs from the family favorite. As families prepare for holiday gift giving, Universal Studios Hollywood’s popular “Buy A Day, Get 2014 Free” annual pass returns, offering tremendous value and visits throughout 2014 for the price of a single day’s admission. Guests who purchase the “Buy A Day, Get 2014 Free” pass can return to experience Universal Studios Hollywood’s award-winning thrill rides, including “Transformers: The Ride-3D” and the new “Despicable Me: Minion Mayhem” attraction opening in spring 2014. The pass will also invite guests to receive savings on tickets purchased for visiting friends and family. For more information and to purchase tickets, guests can visit www.UniversalStudiosHollywood.com.